Mariana, age 25 months, helping with the gardening at home. Where does the love of dirt begin for a child? Are certain children more likely to love the FEEL, the coolness, the texture, the color, and the DIRTiness that comes from dirt? Maybe it is learned? Maybe it is innate? Because - let's face it - dirt is so very dirty. My friend and teaching colleague Vanessa posted a "hands-on, body-in" photo of her 25 month old daughter Mariana. Mariana is focused in her garden at home, working at transplanting with the vigor and finesse of a two-year-old : hand in a fist and giving a good yank to the start up plant from the small container. Gift #1: Mariana is dressed for getting into her work and contributing her efforts to the family garden. Gift #2: Mariana is allowed by her parents to sit right in the middle of that garden patch - right in the middle or the corner or wherever she plopped herself down. Gift #3: Mariana was offered the plants to grasp [good luck, little plants!] and had the opportunity to experience for herself the feeling of the dirt dirt dirt. From the early childhood educator lens, I loved this photo so much that I had to ask for permission to use it for a blog post. Consider: Many educators are in favor of offering no-mess experiences because - well - it is easier. Consider: Many educators are in favor of directing children exactly "the right way" something needs to be done (whether 2 years old or older). Consider: Many educators have a whole List Of Rules of how and when and why not and don't. Can you allow for exploration? Can you allow for the child to lead her own discovery? 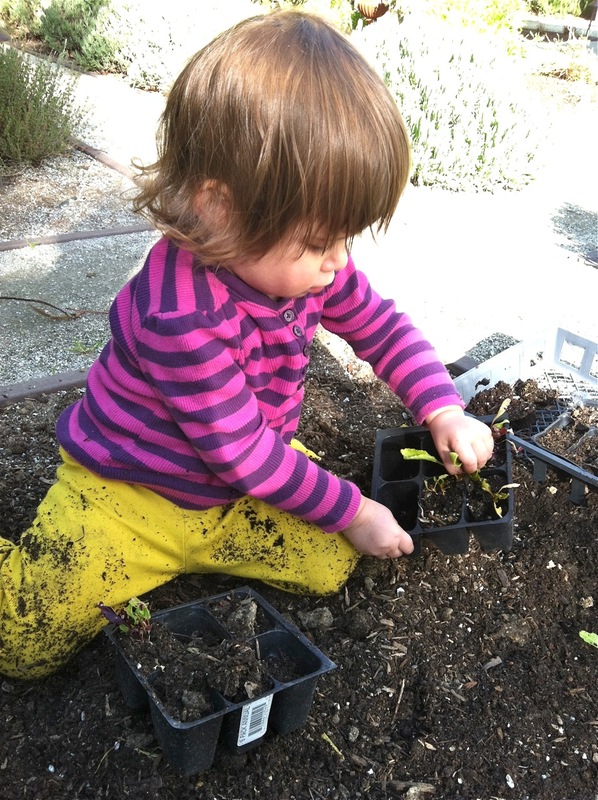 Can you allow for a little dirt to be the source of an invaluable sensory experience? 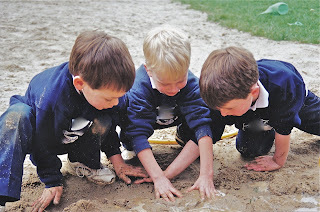 boys hands-on in the muddy sand. *Thank you to Vanessa and Mariana for inviting us into the middle of their garden to feel the wonder of dirt. Wonderful post, Jeanne. And so true. Children need many opportunities for whole body exploration, trial and error, and TIME. Thanks Pam! Yes, sometimes the children need to go All In! cheers. I love this post, and thank you for the wonderful insight. Thank you Jeanne! Mariana is most happy when she can really get "hands on, body in". So true! Vanessa. Thanks for sharing Mariana as a colorful, sweet example of engaging play in dirt ! If you would like me to counter the "dirt" post with a series on how adorable she is in other outfits in cleaner play, I understand :) Thanks again. Brilliant post Jeanne - my mantra would be the messier the better! Awesome- love it when clothes arent the important thing- We are having an increased number of home gardeners ordering raingear for children tending gardens! Alex - thanks for the comments! Exactly, must have the right play clothes for Rain, Gardening, Mud, all the good stuff. Dirt is fun... even when you have to clean mud off the kitchen table. Today my son and his friend (both not quite 3) planted pansy seeds and will watch them grow then plant them outside in the spring. 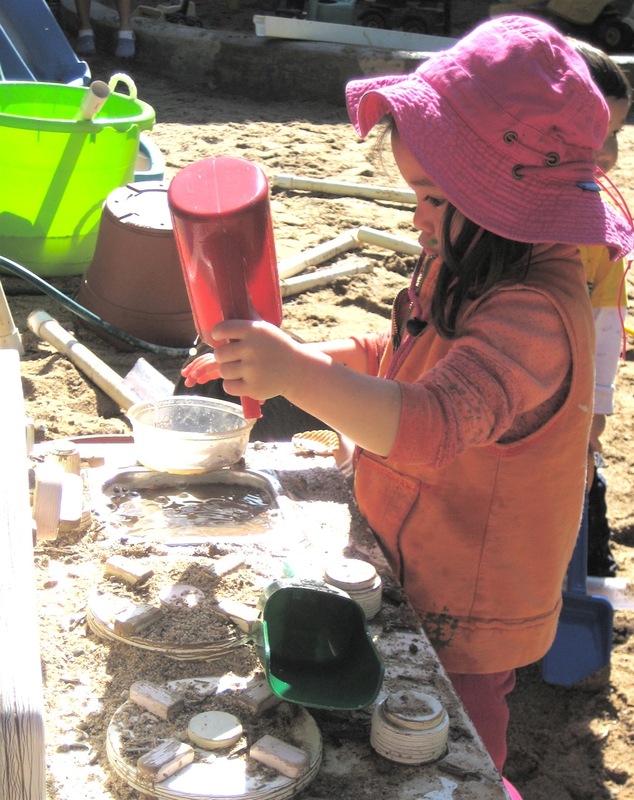 Cleaning is such a minor issue when children are focused and engaged in sensory play - dirt, water, goopy stuff, whatever. How dear that your son and friend planted pansy seeds! Watching real plants come up is such a wonder, and moreso when experienced through the eyes of young children. Enjoy! We are in favour of dirt - clothes can be washed - baths are fun so if we have 2 or more in a day then all the better. This afternoon we've been out in the muddy garden - my 2 and a 1/2 year old has been playing in our flooded sand pit with a mix of sand, water, stones that he's added over the winter, all his sandpit toys. Whereas my almost 1 year old has been crawling all over the lawn feeling the grass, the texture of stones, taking soil out of the pots and putting it back in and even tasting the occasional handful of more interesting dirt from the garden (she found she didn't like it)I wouldn't want it any other way. I have only put my son's name down at a pre-school where indoor and outdoor spaces collided and I knew it was one for us when they introduced me to the mud making kitchen. Yes, working with and playing with soil, planting, composting, discovering bugs and worms, digging, such an important part of childhood! Thanks for the reminder! Yep, seeing children who enjoy the muddier side of exploring be allowed to do so is really lovely. Cheers! As an urban art teacher in a public school, I (and my co-teachers) have to do a lot of advocacy building to create a culture of dirt climate. We have some raised bed gardens on our playground, and go outside even when it rains. It still is a lot of work to convince families that this is positive and even educational). A few weeks ago we took a trip with the purpose of exploring and collected and encountering dirt/mud. It was magical despite not having every kid in shoes that gave them full engagement. We are trying to figure out how to purchase a whole bunch of rubber boots that would fit everyone to leave at school-it's a good goal, isn't it! I love the idea of shared boots at school for just such exploration - it IS a great goal! Maybe families can donate? I love this...I am a HUGE fan of all things dirt and mud. I second the post above-the messier the better! Thanks for all your wonderful work. Your posts are a joy to read, and an inspiration! Bring on the dirt, right?! Thanks for the support and good cheer - so very appreciated! Thank you again for the inspiration!!! We both must have mud on the mind! My kindergarten kids love dirt - and have (or are supposed to have) extra clothes at school so that they can enjoy dirt, puddles and mud. I keep a pair of rubber boots (with zebra stripes) at school so that I can join in the mud and puddle fun. I just posted about mud over the week end. Oh, love the mud boots idea! Children love "stuff" and "tools" anyway in their play - hats, glasses, boots, gloves, etc. so mud boots sure seem a natural resource to get INTO the play of dirt! cheers.